Working with Successful Endeavours not only gives you access to a set of technical capabilities, you also get a mindset that has created profit opportunities for our clients and consistently delivered successful projects. Below are descriptions of our projects to assist in giving you a clearer understanding of our typical electronics and embedded software projects. These are typically communication driven industrial IO modules, data loggers, sensors or user interfaces. The emphasis is usually on robust and reliable operation. These are executed using an 8 bit microcontroller such as one of the Atmel AVR range. We analyse the design to determine what to do in hardware, what to do in software, and how to best meet fastest time to market, highest performance or lowest system cost, whatever is the highest priority goal for a project. RS232 based GPIO module with 8 digital inputs (built in pull-ups), 4 analog inputs, 3 digital outputs (open drain) and an iButton reader. It has onboard EEPROM or FLASH data storage and can be reconfigured in software to be an access control device, SCADA interface, data logger or general purpose controller. All inputs and outputs are abuse protected and can withstand +/-60VDC or direct connection to a +12VDC or +24VDC automotive power source including the digital outputs (which means they will survive a load dump). Shock and vibration sensors, 2D and 3D. These are +12VDC or +24VDC devices with RS232 communications and onboard data logging allowing recording of the actual waveform of a shock event at rates up to 2.5Ksps per channel and non-volatile storage for later retrieval and examination. They are capable of stand-alone operation or as polled devices. Shock ranges are from +/-2G to +/-10G. 2D and 3D devices also have real time tilt angle measurement and can be used to detect impact, vehicle lean, fork lift tipping, fork lift mat angle control and fork lift speed control based on mast angle. Real time integration techniques are used to determine energy transfer levels and not just peak shock loading allowing significant reduction in false positives associated with equipment loading and unloading of metal containers on trucks and ships, rail and road haul carriers. Power Factor Correction Controller for management of parallel output banked PFC units. These can be independently enabled and disabled to provide correction of lagging currents within a major factory or industrial area other similar facility. They included SCR fault detection (open and short), current imbalance monitoring, over current and current spike monitoring and over temperature management including metrics based rule sets for determining when an alert is raised. The entire system was simulated on a PC running the embedded code within a mock of the system so it could be fully debugged within an automated test suite prior to hardware being available. High Voltage Contactor Controller with metrics based input sanity checks to prevent spurious contactor close or open events during excessively noisy periods. Active RFID based proximity monitoring systems used to alert forklifts of the proximity of another forklift or of a pedestrian. Up to 30m range. Can also be used to trigger safety crossing lights so that lights only flash when a forklift is nearby. This reduces the tendency to ignore lights because they flash all the time and improves OH&S outcomes. All the above projects were executed using Atmel AVR microcontrollers with less than 16K FLASH. This is more a reflection of the efficiency of the design process than the simplicity of the task. 2D and 3D shock sensors with load dump rated power supplies and protection added to them. These are installer proof. Wire them up randomly and they won’t be damaged, even if a load dump occurs while not wired up correctly. Upon correcting the wiring they then work to specification. Vehicle authorisation system using iButtons and including offline operation. This is a fully load dump rated device with onboard battery backed RTC and data FLASH storage of driver records and events. It connects to an existing vehicle management system via RS232 which has on board GSM communications. Driver authorisation records can be stored in the device so it will operate when out of range or if the vehicle management system fails. Event records can be uploaded later on to confirm actual events. Because access authorisation records are stored internally in FLASH, they can be deployed ahead of a vehicle management system roll out. Another option allows the same device to be used for gate and door access providing a single security token across an organisation. Traditionally, contact based ID devices have been both cheaper and more reliable in automotive environments. Adding TCP/IP and boot loader capabilities to an experimental solar energy power converter and also building a PC side DLL to ease development of a Labview based control environment. Internal functions were then added. This allowed the developer to limit their team to a single person on their side and brought forward the project by several months. The 802.15.4 based corrosion protection monitor is a multi-award winning device in two categories for the 2009 EDN Innovation awards. It has to run for up to 6 months from 3xAA batteries and has a novel analog front end that gives it a +/=10V or +/-150mV software selectable full scale range while giving 60dB of rejection to mains frequencies and handling abuse voltages of 5000V for 2 seconds and 250VAC continuously. We also provided a PC side application to do real time monitoring, configure logging runs, retrieve logged data (up to 500K points with battery backed RTC time tagging) and manipulate the data within a graphical environment. GPS based vehicle management system for low cost monitoring of container handling vehicles in Asian ports. This included monitoring vehicle signals such as twist lock status, container size, driver authorisation, GPS position, shock monitoring and with spare inputs and outputs so other parameters such as fuel level, engine temperature and oil temperature could also be monitored. Forklift speed controller that allows automatic speed reduction in slow zones and loading ramps. The actual interfaces varied from forklift model to model. This was fitted by the client as an aftermarket option for older forklifts. The controller for a banked rectifier battery charging system. This was an upgrade of an existing product and we worked along with the existing R&D team. In particular, we designed the architecture and the operating system for the device. We then created a full system mock that allowed the code to be tested down to device driver level months before any hardware was available and let the full user interface be tested prior to finalising hardware for that. This included a range of display options and buttons. We then implemented the most complex internal systems of the device including translating the battery management routines that had previously been executed into code compressed assembler and created a configurable peripheral control architecture and that allowed full backward compatibility. We also built the arbitration interfaces that allowed a shared SPI bus to be used by multiple subsystems without them having to specifically cooperate. This was our largest recent project and was implemented on an Atmel AT91SAM7X512 device with 512K FLASH and 64K RAM. Garbage collection cycle reminder showing which bins go out this week. Small, single pushbutton, dual LED device with 2 years operation from 2 x AAA batteries. Rain tank water controller allowing you to select rainwater or mains water from a remote control panel inside the house. Hookup via inexpensive CAT5 cable with automatic detection that the far end valve PCB is connected, the batteries are OK and the tank level is OK. Runs from 2 x 9V batteries for 2 years. Pool and spa pump controllers. Several models with a range of features including water temperature, blower setting, pump setting and a range of fault indicators. All emphasising low cost and reliable operation with fault monitoring from models of the controller that allow the incoming mains voltage to be inferred within 2% from the secondary voltage on the transformer isolated power supply. This allows high mains and low mains protection for the pump without the added the expense of an additional isolated mains monitoring circuit. Air blower for spa baths with a programmable interface allowing it to be retrofitted to a range of existing pump controllers and user interfaces. Lots of protection features and power control options. Very low power wrist worn bicycle indicator. We did the circuit board and reduced the power consumption by a factor of 6 by using shorter but higher intensity LED pulses (taking advantage of persistence of vision effect) and adding a sleep mode so it consumes 1uA when not in use. The battery life became six months of typical use from 2 x A76 button cells. We designed a customised audio mixer for an Australian tertiary college air pilot training program. The college provides International English language training and assessment for air traffic controllers and pilots in a range of countries. Our client had been using a cheap mixing desk with separate leads, adapters and expensive aviation style headsets. 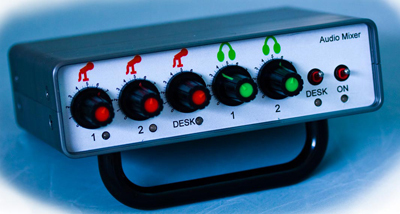 We designed a customised desk which used standard PC electret headsets and managed all the signal routing and side tone modes from a minimum of controls. Mode control was a single switch and headphone and microphone volume was one knob per function. Sound quality was better than the existing solution and the total package cost less than the headsets they had previously been using. They are made in small batches and we also organised that. And last but not least, it is exclusive to the college and increases their prestige in the marketplace. iButton security token readers for embedded, networked and PC connected applications. Access controllers with both local storage and networked authorisation. Capable of offline operation with event logging for forwarding of events once communications is restored. Non-volatile storage of security settings, records and events. Contactless swipe card readers including MiFare, HID Proxcard II, HID iClass, weigand based and Indala card readers. These can be IP68 rated for outdoor use in unenclosed vehicles. Security protocol converters to adapt token representation for multiple systems deployed at the one site. This allows adding a new system for one area but still having a single database that controls the access privileges and security token IDs. We designed the PC based valve controls for an Epidural Simulator and then the Air Ram based air/saline simulator for the syringe response mechanism that allowed simulation of the syringe for medical students and practitioners learning to perform epidural injections. During the development of the USB connectivity we proposed the idea and developed a set of equations to infer the external syringe position from a model of the internal system and knowledge of the current pressure and the current position of the internal cylinder. This allowed us to respond to pressure on the external syringe as if either air or saline was in the syringe. This overcame a huge drawback of simulators that used saline, which is that the saline ends up all over the instrument, students and the floor. Every aspect of the electrical and software control was executed by us including the BLDC position controller and the software system that managed it and processed the pressure and position models in real time. In addition, we regularly get involved in general development, system testing and debugging. System sizes vary from 32K to 512K of compiled code depending on the complexity of the unit and whether it is a specific device such as an immobiliser, door unit, siren or stalk switch unit; or a full blown body computer responsible for co-ordination all the functions of the vehicle apart from engine management and safety critical ABS and air bag systems.